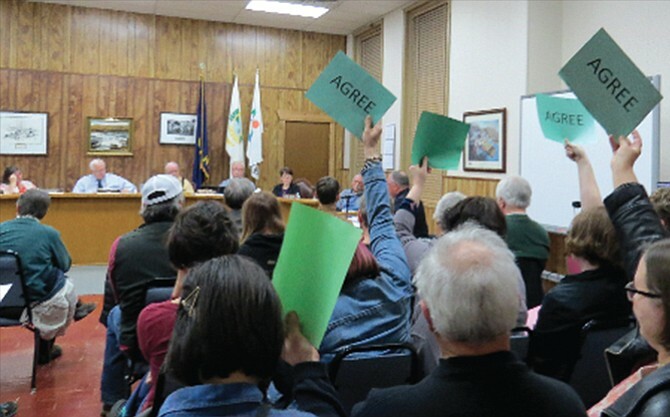 Audience members use signs reading “Agree” or “Disagree” to signal their response without being disruptive during an open hearing at The Dalles City Council Monday night. About 70 people were in attendance to hear complaints of misconduct levelled against Councilor Darcy Long-Curtiss. An open hearing Monday to consider the censure or reprimand of The Dalles City Councilor Darcy Long-Curtiss drew an overflow crowd and was referred to as an “inquisition” by her attorney. “I’m here tonight to urge you to cease immediately from trampling Councilor Long-Curtiss’ free speech,” said her attorney, Bradley Timmons, who warned the council there would be “substantial legal consequences” for violating her constitutional rights. He said personal liberties enshrined in the U.S. Constitution could not be written away in a municipal code of conduct. “Being elected does not mean that she gave up freedom of speech,” said Timmons. He said in addition to the First Amendment that granted all citizens the right to express an opinion without fear of reprisal, the 14th Amendment limited state and local officials from taking action to strip those rights. In addition, he said the 14th granted all citizens the right of “due process,” which had been denied to Long-Curtiss because she was never officially presented by city officials with a copy of the complaints against her. “She had 30 seconds to prep for these allegations,” he said. No action was taken after City Attorney Gene Parker recommended against it until he had more time to make sure the council was “on solid legal ground.” He said the city’s insurance carrier had urged “caution” because another municipality had lost a case involving a $5 million verdict after terminating an employee for giving an unpopular opinion. “This is an area that’s somewhat gray,” said Parker. Councilor Taner Elliott requested that Long-Curtiss be disciplined for public statements she had made about the council and some members of the Columbia Gateway Urban Renewal Agency. He said by speaking out against the council and members of the agency, Long-Curtiss had violated the city code of conduct, which governs how public statements can be made. He said the pledge of the council, as leaders, was to treat others the way you would like to be treated. He said Long-Curtiss’ publicly aired opinions had been “divisive” and disrespectful of others who serve in an appointed or elected capacity. “We must treat our fellow citizens and leaders with respect,” Elliott said. At issue was Long-Curtiss’ open criticism of a mayor appointee to urban renewal. She objected to his confrontive questioning of two developers about their finances, especially when he had two personal bankruptcies in his past. She also stated the belief that some city officials were actively working to shut down Michael Leash’s plans to site a national brand hotel downtown and also Sunshine Mill, due to a dislike of its owner, James Martin. Long-Curtiss indicated that other actions were being taken by the council behind closed doors. Timmons objected to Elliott’s charges because they were vague in nature and no specifics, such as dates, were provided so that Long-Curtiss would know exactly what she was accused of. Long-Curtiss said she had written a general statement to address what she believed Elliott might say.“We were elected by the citizens of our city to represent them on this council using our independent knowledge and judgement,” she read. She stated that, on Feb. 13, Mayor Steve Lawrence used “false pretenses” to get her to city hall, where he chastised her in front of Daniel Hunter, human resource director. Long-Curtiss then said: “I asked him why he brought me there on false pretenses. He said because he thought I wouldn’t come if he told me the real reason. He said he didn’t like my attitude and the things I was saying in public.” She said the mayor then referred to the same information Elliott had referenced. She added: “Apparently, the mayor was not satisfied that I was unwilling to submit to his directive and now here we are tonight apparently addressing the same issues, this time brought forward by Councilor Elliott,” she said. Lawrence said he had not planned to say anything during the hearing, but since Long-Curtiss had chosen to talk about their private meeting, he felt compelled to do so. “The explanation I gave for not telling her all the reasons I wanted to see her was because I had emailed her twice before and asked for her to return a call to me and talk to me and she had refused,” he said. “I didn’t refuse, I was sick,” said Long-Curtiss. He opened the meeting by explaining that the council’s code of conduct, which had been signed unanimously, had been modeled by the League of Oregon Cities and other samples provided at a leadership training seminar. He said the same code had been adopted by other government agencies to guide the behavior of elected officials. Councilor Russ Brown criticized Long-Curtiss for being “aggressive” in her remarks. In particular, he didn’t like way she had “harshly” addressed Chuck Gomez, owner of the Granada Theater, when he came to the council last year asking for marketing funds. Brown expressed no interest in acting against her but said “perception” was a very powerful thing and he felt she was harming the image of the council. “I only gave my opinion and I had a right to say it,” Long-Curtiss responded. She was also criticized by Councilor Linda Miller, who said Long-Curtiss alluded to her making a wrongful urban renewal vote, which she had not. Long-Curtiss said she had not addressed Miller’s vote specifically. She said she simply answered a reporter’s question about why she had been the sole “no” vote on the Tokola Development proposal. Councilor Tim McGlothlin said he wanted to see a change in the process to deal with code of conduct violation hearings. He said Long-Curtiss should have been provided with documentation of the charges against her and there should have been an arbitration process in place to get the issues resolved before it got to the level of a hearing. To conclude the meeting, Lawrence said it would be helpful if Long-Curtiss refrained from going to the media with her concerns, which drew jeers and boos from the crowd. No audience participation was allowed during the hearing. However, the crowd held up red “Disagree” and green “Agree” signs to show support of Long-Curtiss and opposition to Elliott and Lawrence. Resident Chip Wood yelled out that Elliott should be the subject of a censure since he had been found in violation of two conflict of interest laws and two involving his use of an elected office. Wood filed the complaint with the Oregon Ethics Commission that resulted in the ruling against Elliott.